I am out on vacation this week, but I wanted to drop some pictures into the blog. I added some weathering on my Hell Hound Variant before leaving for Lake Michigan (sometimes its good to be the Doc!). This is my standard Cadian scheme. Nothing fancy, just clean colors and some decals. 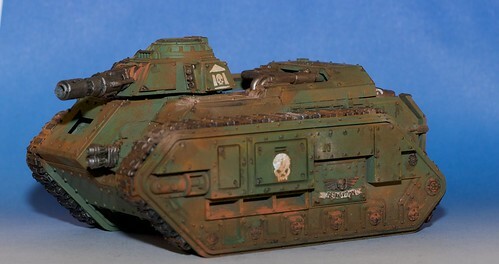 Now, the weathering: I used my weathering pigments and thinned them with paint thinner. As I mentioned before this gives you the ability to add the pigments without fear of them rubbing off (or flying off with the propellant from the sealers hits it). It also turns the process into more of a glazing medium than a 'dusting' medium when you use the pigments plain. Its all about preference I guess. One thing I do - which I think would be very fitting for a hellhound, is try to simlutale leaking prometheum. I use brown ink, or in some cases, a mix of burnt umber oil paints and thinners, depending on the surface. 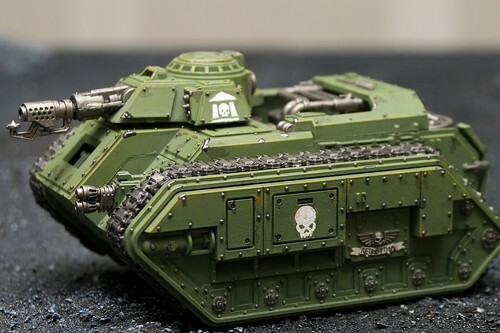 Another great looking tank, very well done! 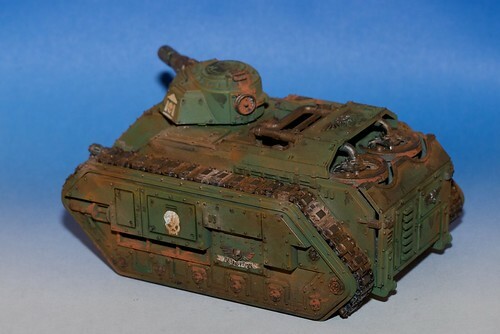 That's really interesting to see how the weathering pigments worked with the paint thinner. Are you happier with the process that way than without the thinner? I didn't notice until I saw the comment above from Karitas but the ends of the flamer nozzles probably would look nice with some scorching or staining. I hope you have a great time on vacation, sounds like fun times.